Tunnel–eroded landscape near Redcastle (25 km north of Heathcote). How does one interpret a degraded landscape such as the one depicted above? 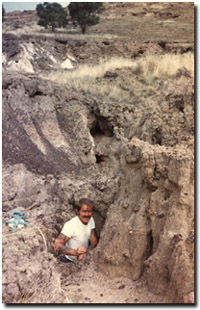 The fundamental cause of degradation at the above site was tunnel erosion, although rills and gullies were also present. 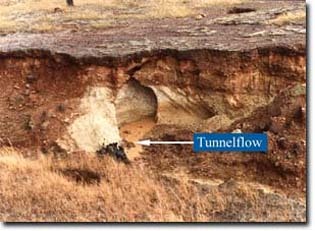 Largely because of its subsurface origins, tunnelling produces a range of landforms that are often distinct from those produced by other types of water erosion. Tunnels usually consist of a network of branches with different drainage patterns, and this aspect of the phenomenon is discussed in a related article on landscape factors. The aim of the present document is to identify and describe the most common landform features associated with tunnel erosion. 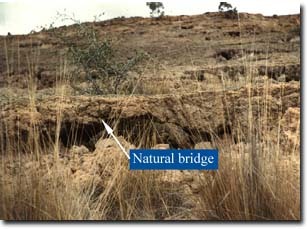 The distribution of tunnel erosion in Victoria is covered elsewhere in this website. 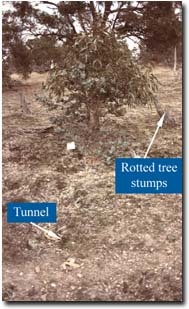 Tunnels are initiated when water infiltrates through to the subsoil via macropores such as soil cracks and surface depressions or follows paths left by rotted tree stumps and grass roots. Certainly in the advanced stage of tunnel development, it is usually quite easy to see the chain of causation between tunnels, soil cracks, tree stumps and depressions in the land surface. 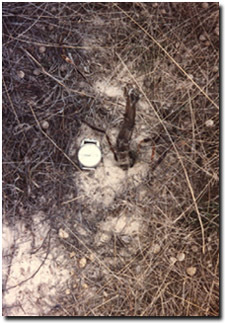 However, the evidence of flowpaths left by decayed grass roots is not so obvious at the land surface. The dimensions of a network tend to increase with each rainfall event that produces tunnel discharge (see hydrology of tunnel erosion) as the soil aggregates lose their structure. 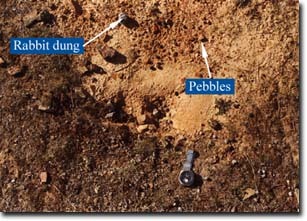 The disintegration of the soil material is a result of the processes of slaking and clay dispersion (both spontaneous and mechanical). Tunnelflow transporting eroded soil material through a gully wall near Costerfield. The scale of tunnel erosion varies as a result of a number of factors including historical and current land-use, climatic conditions, soil properties and vegetative cover. Tunnel dimensions are difficult to measure on the White Elephant Ridge of the Parwan Valley because of the depth and complicated connectivity between collapse features. 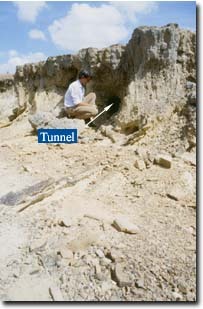 Tunnels per se are inconspicuous prior to sinkhole formation (see tunnel erosion). If the systems are shallow or have eroded to the point that they are just below the ground surface, they may be prone to collapse and prove to be dangerous for people, livestock and farm vehicles to pass through the affected area. For example, Hosking (1967) noted that tunnelled land in the South Island of New Zealand was a hazard for sheep and that orchard trees fell into tunnels and died. The survival of trees was also compromised by a condition known as ‘wet feet’ where water was concentrated in the erosion channels. Cattle have fallen into tunnels and died near Woodleigh in West Gippsland (DM Crawford pers. comm.) Even exposed channels are dangerous to walk round because of undercutting by tunnelflow. tunnel owing to undercutting in the Parwan Valley. 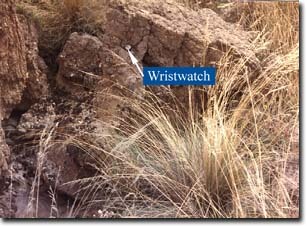 This wristwatch is shown here to indicate size. Tunnel collapse caused by human traffic near Costerfield. The author fell into a tunnel approximately 60 cm deep when the soil surface gave way. The vertical collapse features through which a tunnel can be seen are known as sinkholes. These landforms can be caused by tunnel enlargement, whereby the ground surface does not have sufficient strength to remain intact or are collapsed prematurely by the weight of humans, animals, farm vehicles and/or machinery. 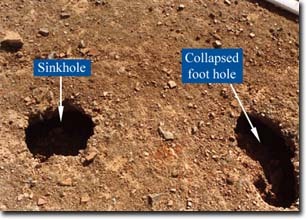 As is the case with tunnels, sinkholes can often indicate only a small part of subsurface collapse so that the perimeter of the hole may also be undercut. Therefore, one should also be careful when walking near these features as soil cracks may not be evident and the sinkhole edges can give way. Furthermore, in one network in the Parwan Valley tunnels were observed through a sinkhole at two levels, the total depth being 7.6 m. This example is the deepest sinkhole recorded to date in Victoria. 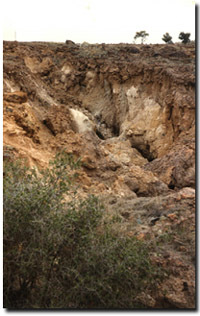 When sinkholes merge, a section of open gully remains. Sinkholes near Sunbury. Photograph: D M Crawford. gully section in this tunnel network in the Parwan Valley. A natural bridge often remains between sinkholes. The bridge can be undercut by tunnelflow and is also susceptible to collapse when the span is unable to support its own weight and/or that imposed upon it. Tunnel discharge can return to the surface in a number of ways. The transported sediment may be deposited in a tree stump, presumably after following the path of an old root. Other exit points are ant holes, soil cracks or directly through gully walls. 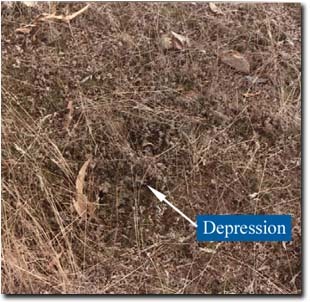 When the eroded soil material is observed on a hillslope, it usually takes the form of a debris fan which is difficult for plants to colonise. These fans are also clearly seen from aerial photographs. Where the transported material is deposited directly into a gully wall, a ‘debris fan’ may not be evident as the sediment becomes part of gully discharge. The coarser material is deposited in the first instance as the discharge decreases and is found around the outlet. On the other hand, finer particles such as clay are transported in suspension greater distances to other locations. around a decayed plant root in the Parwan Valley. that has been transported through the tunnel and the evidence of rabbit activity. A tunnel exit in a gully wall near Costerfield. 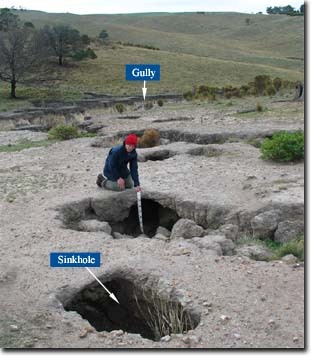 Tunnel erosion produces a range of distinctive landforms because of the various sub-surface processing and examples have been shown from a range of sites in Victoria. Tunnel-eroded landscapes can be dangerous places for humans and animals to traverse and, when well developed, can also impede the traffic of farm machinery. Tunnel erosion provides a source of sediment that can impact on farm dams, reservoirs, rivers and estuaries. Affected areas should be reclaimed where possible, as the soil and nutrients are eroded with each episode of tunnelflow and this further diminishes productivity.